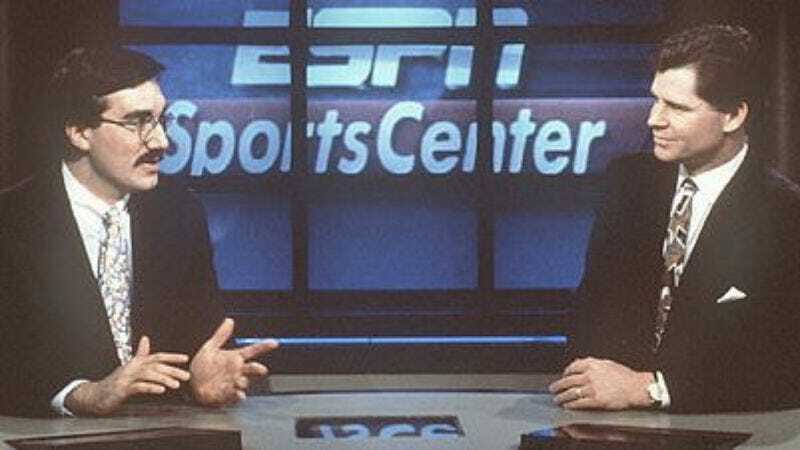 The tangled, sometimes scandalous story of how ESPN became “the worldwide leader in sports”—as detailed in James Andrew Miller and Tom Shales’ oral history Those Guys Have All The Fun—has reportedly been optioned by 20th Century Fox to be developed as a feature film. No director, writer, or actors are attached yet, though the film will be produced by Michael De Luca, Dana Brunetti and Julie Yorn, two-thirds of whom were involved with The Social Network. Judging by Miller and Shales’ book, a movie about ESPN could bear some similarities to a movie about the founding of Facebook, in that both stories area about an obviously valuable media property that begins with a rebellious spirit and then becomes more closed-off and back-bite-y once the money starts rolling in. So… yeah, we’d watch that. Now we just need some casting suggestions. Seth Rogen as Charley Steiner? Anna Kendrick as Suzy Kolber? Josh Charles and Peter Krause as Keith Olbermann and Dan Patrick? Whaddaya got?